You have to hand it to Mike Leigh, a filmmaker who has the confidence to make a $20 million period musical with limited commercial appeal. In 1999, he released Topsy-Turvy, a musical drama chronicling W.S. Gilbert and Arthur Sullivan’s creation of The Mikado in 1884-85. In addition to examining the creative conflicts between playwright Gilbert and composer Sullivan, Leigh does a fantastic job recreating Victorian era British life including the minutia of theater life and society in general. Known for his gritty depictions of working class people, this film was (and remains) seen as quite a departure for the filmmaker but it did offer him the opportunity to tell a story about the creative process and the challenge of artistic collaboration, which mirrored his own process of filmmaking. We are introduced to Gilbert (Broadbent) angrily reading a review criticizing his and Sullivan’s latest work, Princess Ida. They have stopped working together because Sullivan (Corduner) feels that their collaboration has become routine. However, he is chronically sick, taking morphine injections every day in order to function. He heads off to Paris to indulge in their brothels while Gilbert pulls Ida and replaces it with a revival of The Sorcerer. Fortunately, his wife Lucy (Manville) takes him to the Japanese Exhibition in London and he becomes fascinated by Kabuki Theater. He experiences an epiphany and comes up with the genesis for The Mikado. He is soon reunited with Sullivan and the rest of the film plays out the backstage trials, tribulations and hijinxs that ensue. 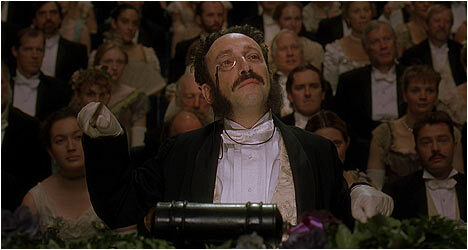 Jim Broadbent and Allan Corduner do an excellent job of portraying one of the most famous artistic duos of all-time. The actors convey how these artists with very different approaches to theater brought out the best in each other when they collaborated together. They weren’t afraid to challenge each other and ended up complimenting their respective strengths and weaknesses. The attention to period detail, like the richness of Gilbert’s study, is quite impressive. Also of note are the period costumes, especially the vibrant Japanese attire for The Mikado. Not surprisingly, one’s enjoyment for Topsy-Turvy hinges on your love for Gilbert and Sullivan musicals. Leigh’s film is well-written, brilliantly acted (Broadbent has never been better) and masterfully directed but personally the subject matter fails to engage me. I prefer his contemporary dramas but for those who like period musicals, this film is pure catnip. While Topsy-Turvy is a superb backstage drama and biopic, it certainly isn’t for everyone and this resulted in fairly dismal box office returns when it was first released. Kudos to the Criterion Collection for giving Mike Leigh’s film the deluxe treatment. This is the kind of niche film that they excel at championing. The first disc features an audio commentary by writer/director Mike Leigh. The always engaging filmmaker speaks passionately about the subject matter. He also talks about the nuts and bolts of his filmmaking process – i.e. how he works with actors, how he establishes mood and atmosphere, and so on. Leigh also tells a few filming anecdotes on this solid track. The second disc starts off with a conversation between Leigh and musical director Gary Yershon. They talk about the differences between Gilbert and Sullivan and how much they drew from historical source material in Topsy-Turvy. Leigh also talks about his intentions, like how he wanted to comment on the filmmaking process. This is a lively and memorable discussion. Also included are four deleted scenes including a cut song. Leigh was contractual obligated to deliver a certain running time and even though he pushed it, footage was still cut. “A Sense of History” is a 22-minute short film that Leigh made in 1992 starring and written by Jim Broadbent. In it, he plays the 23rd Earl of Leete, who takes a film crew on a tour of his estate. It was at the time of the making of this short film that Broadbent and Leigh began talking about Topsy-Turvy. There is a featurette made at the time of the flim’s release that is a fairly standard mix of talking head soundbites and clips from the film. Leigh and some of the cast speak eloquently about the film and Gilbert and Sullivan. Finally, there is a theatrical trailer and three T.V. spots.